On Wednesday, May 9, 2018 the DC Department of Employment Services (DOES) honored me with the Hard Work and Dedication Award. 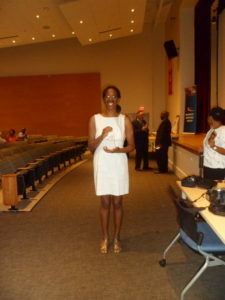 She received this award during the inaugural Workforce Recognition Event. Held at the University of the District of Columbia Bertie Berkus building, the DOES Workforce Recognition event honored its best participants. Visit www.carlarjenkins.com/work and info@carlarjenkins.com to reach Carla R Jenkins. Thanks Michele! I am honored to receive this award.